His first play during his first game on the varsity football field as a freshman, Darien defensive end Mark Evanchick recorded a fourth-quarter sack against Danbury. Many would look at that play as the beginning of a stellar career at Darien in which Evanchick would break school and state records, end a long losing streak to arch-rival New Canaan and win one state and two FCIAC championships. Evanchick remembers it a bit differently. It did feel pretty good though. NOTEBALE: Evanchick, the Hearst Connecticut Media 2015 Boys Lacrosse MVP, carries a 3.34 GPA and will pay lacrosse at the University of Pennsylvania. He is an all-state lacrosse defenseman and is considered the best at that position in Connecticut. The tackle may not have been one to highlight in film study, but it did launch a four-year span that would see Evanchick eventually break the state’s all-time sack record previously held by NFL star Dwight Freeney. Now, Evanchick has been named the Hearst Connecticut Media Super 33 MVP, becoming the first defensive player to take home the honor. The award gets piled on top of his Gatorade Player of the Year award, the Walter Camp Player of the Year award and more personal accolades. But if you think Evanchick reveled in the spotlight, think again. In the “look at me” age in which we live, it was always about team goals with Evanchick. Asked about his best times on the gridiron, the sack record does not even get brought up. If the state championship is on the top of his list, never losing a Thanksgiving game to rival New Canaan comes in a close second. Evanchick was a freshman, with sophomore George Reed playing the other defensive end when the Rams came to Darien in 2012. It was his first time playing in front of a capacity crowd and it would be the first time Darien defeated its rivals on Thanksgiving in 10 years. The Blue Wave would not lose on Thanksgiving to New Canaan during Evanchick’s time, though the Rams did beat them in two Class L state finals. Going out with a clean Thanksgiving slate is something Evanchick bursts with pride about. Praise has come in from around the state for Evanchick, including from Staples coach Marce Petroccio, whose team had to face Evanchick twice, once in the regular season and once in the LL opening round. It was against Staples in November where Evanchick would take down the Wreckers quarterback, finishing the game with three sacks, putting him at 62 ½ for his career, leaving him alone atop the state record book. Evanchick would end his career with 66 ½ sacks, four Turkey Bowl victories, two FCIAC championships and one Class LL championship. True to his humble nature, Evanchick wants his legacy to not exist in the record books but with the team and attitude he leaves behind at Darien. Evanchick always spent time with younger defensive players at practice, taking them to the sled to work when the offense was practicing, always with an eye toward Darien’s continued success after he has graduated. Whatever it is inside Evanchick motivating him, it worked not just for him but for the entire team who fed off his desire to win and constantly get better. 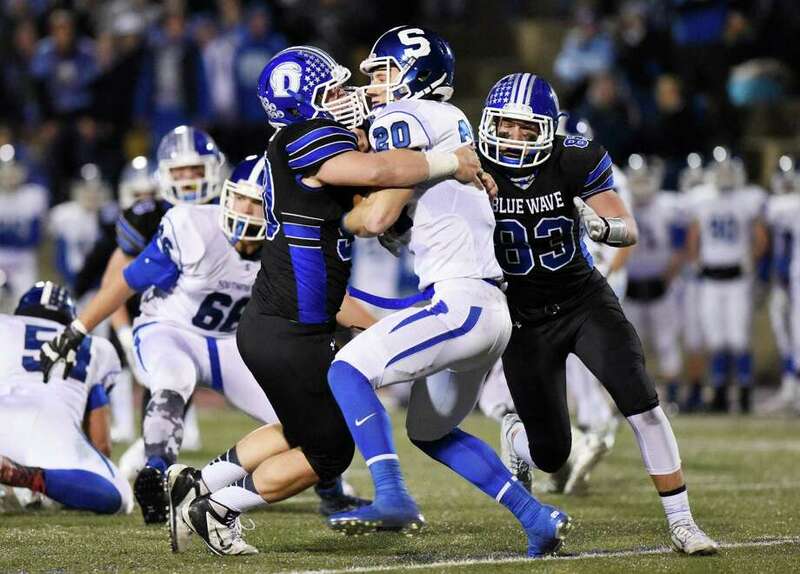 It is a huge reason why Darien won its first state title since 1996. It may be a while before we see another player like Evanchick.